Clean Ocean Access recently released its annual Marina Trash Skimmer Report detailing the success of the Marina Trash Skimmer (MTS) program over the past three years, as well as the development and expansion of the program in southern New England, which will include the installation of new MTS units in Providence, Rhode Island and New Bedford, Massachusetts this coming spring. In 2018, the four MTS units on Aquidneck Island successfully removed 5,885 pounds of marine debris from coastal waters, including 4,223 individual items of debris. That is equivalent to nearly three tons of debris ranging from material related to shoreline and recreational activities to smoking and medical/personal hygiene activities. Between April and October of this year, COA conducted 36 site visits of the four MTS units located across Aquidneck Island, and performed detailed data collection at each location. Itemized debris counts indicate that single-use plastic makes up 70 percent of material collected in the MTS units. This low-to-no-value material includes items, such as plastic food wrappers, plastic water bottles, plastic caps, lids and straws. The remaining 30 percent of materials collected in the MTS units include materials related to smoking and tobacco use, such as cigarette butts, tobacco packaging, filters and lighters. The MTS program launched in 2016 when COA received grant funding from 11th Hour Racing to install the first two MTS units on the East Coast. The following year, COA expanded the MTS program with the installation of two more units on Aquidneck Island. Since the launch of the program, COA-operated MTS units have removed a total of 20,615 pounds and over 27,000 individual items of debris from our coastline. “The trash skimmers provide us with important data about the pollution that ends up as marine debris in our coastal waterways,” says Max Kraimer, marine debris specialist at COA. Kraimer works to leverage, facilitate, and establish MTS technology and research on the East Coast. He also leads trainings and educational outreach events with local schools and community groups. Over the past three years, the MTS program has educated and engaged 959 individuals, including elementary school students, college graduates and senior-level scientists studying marine debris.“We’re able to use the technology to educate the public about ocean pollution, bringing visibility to the problem of marine debris and inspiring communities to make environmentally-responsible decisions on land that improve the health of our ocean,” Kraimer adds. The success of the MTS program, made possible by 11th Hour Racing, has led to increased growth and awareness of the technology throughout southern New England. In spring 2019, COA plans to launch two more MTS units in Providence, Rhode Island and New Bedford, Massachusetts. 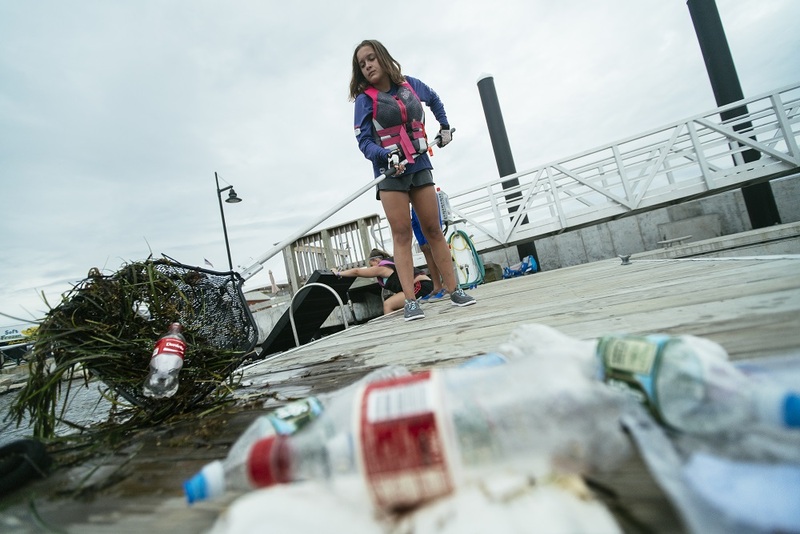 COA will install an MTS unit in partnership with the City of Providence and the waterfront bar, Hot Club, helping to improve water quality in the Providence River and educate Providence public school students on the issue of marine debris. The second MTS unit is in partnership with New Bedford Community Boating Center overlooking Clark’s Cove in New Bedford harbor. “By partnering with Clean Ocean Access and the New Bedford Port Authority on the installation of a trash skimmer, we will not only be helping to clean our local waterway, but we’ll be helping to raise awareness of the marine debris issue and encourage everyone to engage in positive change,” says Andy Herlihy, executive director of New Bedford Community Boating Center, an 11th Hour Racing grantee and community outreach center that teaches positive life values to Greater New Bedford’s at-risk youth through boating. “The skimmer will be front and center on our waterfront, where it will be highly visible to tourists and residents alike. The ocean has historically and continues to be one of our city’s greatest assets and we all need to do our part for its health,” adds Herlihy. COA extends its sincere appreciation to the MTS program partners and sponsors, including 11th Hour Racing, The City of Newport, New England Boatworks, Sail Newport, Bioprocess H2O, as well as to the volunteers and citizen scientists who help make the program successful.